Leonard Peltier was convicted for the deaths of two FBI agents who died during a 1975 shoot-out on the Pine Ridge Indian Reservation. Mr. Peltier has been in prison for over 29 years. 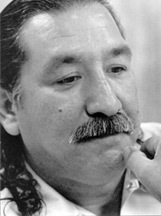 Leonard Peltier was an AIM leader and was asked by traditional people at Pine Ridge, South Dakota, to support and protect the traditional people being targeted for violence. Mr. Peltier and a small group of young AIM members set up camp on a ranch owned by the traditional Jumping Bull family. Mr. Peltier has served over 29 years in prison and is long overdue for parole. He has received several human rights awards for his good deeds from behind bars which include annual gift drives for the children of Pine Ridge, fund raisers for battered women’s shelters, and donations of his paintings to Native American recovery programs.